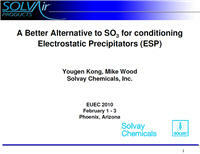 By Yougen Kong and Mike Wood, Solvay Chemicals Inc. Many utilities use SO3 to condition flue gas in order to improve the performance of the electrostatic precipitators (ESP). SO3 is known to inhibit mercury removal whether captured on fly ash or by using powdered activated carbon (PAC). Removing SO3, however, may prove a challenge for those using SO3 to condition flue gases. One solution is trona (Na2CO3.NaHCO3.2H2O). It can lower the resistivity of fly ash and aid in mercury capture by removing SO3. It is well documented that increasing the sodium content in fly ash can lower its resistivity. Therefore, for the fly ash of high resistivity due to either low sulfur or sodium content of coal, adding trona will lower the resistivity of fly ash, and consequently improve the ESP performance. In addition, the added trona will remove SO3 that would inhibit the mercury removal and cause visible blue plume. The trona addition system is simple and its capital cost is much lower than that of SO3 production and injection system.